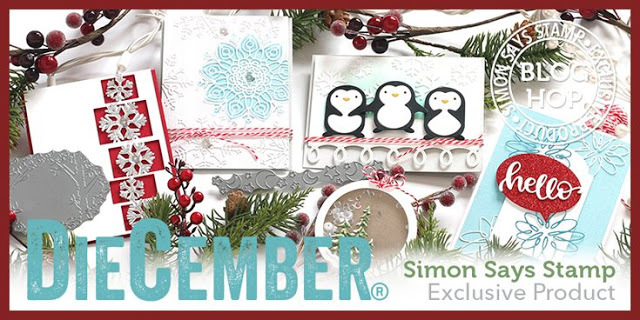 Hello and welcome to Simon Says Stamp DieCember® release blog hop! Its Day #2 of the blog hop. Check out Day #1 blog hop here. So excited about the 33 new dies and the glitter cardstocks released. what can I say? It is Gorgeous! You can find all the gorgeous new products here.I am so grateful to be sent a few and I am excited to share with you a project using couple of them. I am showcasing Arched Stitching Borders die set and the Script Hello die. The border dies are so pretty especially when they are used together. I started with smooshing distress oxide inks in rainbow colours on watercoloured papers to create textured coloured panels. I used Candied Apple, Wild Honey, Spiced marmalade, Twisted Citron, Salty Ocean and Wilted Violet. Then I used the two Arched Stitching Borders dies alternatively to die cut the panels. Then I layered the panels glued them in rainbow order. I trimmed the panels to the size of the card front as I adhered each panel. If you layer them all, it is very hard to cut the thick layer of watercoloured cardstocks. So trim as you go. I adhered the layered panels on Fog card base. Finally I die cut the shadow of the Script Hello die using black cardstock and three Script Hellos using white cardstock. I stacked glued the hellos and adhered on top of the shadow die cut. This sentiment is adhered on top of the Candied Apple layer as shown. Then I embellished the card front using Moonstone sequins and topped the sequins with some Nuvo Jewel Drops in rainbow colours. I let the details of the arched stitched border dies with the rainbow colours be the highlight of the card by keeping everything else on the card simple. Love love the alternate zig zag and scallop borders with the stitched details. This is part of DieCember® release blog hop. You should have arrived from Anna-Karin Evaldsson‘s blog. Your next stop is Virginia Lu‘s blog.There is no blog hop with out giveaways. simon is giving away $25 coupon to every stop on the hop. So don’t forget to leave your comment below. Winner will be chosen over the weekend and announced on Wednesday. Here is the list of all the participants from today’s hop. If you like to bookmark my card, here is the image to pin. That is all from me today. Enjoy your hop. Beautiful card! Love the colors. I really like this card – easy but so very eye catching. I’m always surprised to see what designers do with dies like this one and yours is great! I like the way you layered those border die cuts. What a fun and cheerful card – I always am a big fan of rainbow colours! I love your card and the use of the border die. Lovely rainbow, Gayatri! So pretty and such a great use of the border dies. Very cute. Love that rainbow palette and your layered dies. Gorgeous card! Thanks for the inspiration. That’s such a cool way to use those border dies and I love the rainbow of colors! Neat idea using the border die! 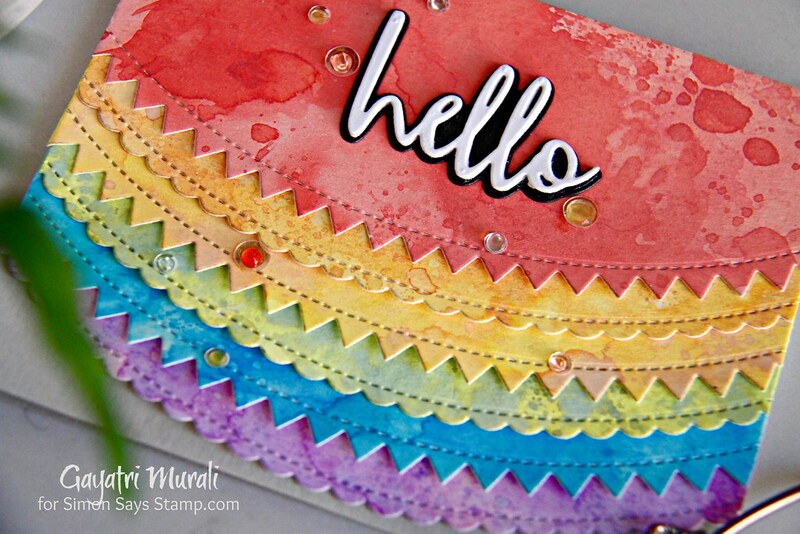 That’s such a cool way to use those border dies and I love the layered rainbow of colors! Color, glorious color! Love this card!!! Fantastic use of the border dies and I love the textural look of it. Those lovely colours set off that die beautifully! Great card and an unexpected use of this die, many great dies in this new release from SSS! Fun & festive. Love the bright colors. Love your card! The colors and texture you got on them is so cool… Thanks for sharing! Love the rainbow effect. Those edge dies are fantastic. I have to get this set. AWESOME Products! Awesome cards! I especially love the gorgeous colors! What a clever and unique way to use the die. It’s beautiful and such a great idea! I love how you added so much color and then the little drops. With the added edges & layers it’s really pretty! Layering the curved dies is brilliant! Nice cards! Beautiful! The dies in this release are just wonderful. Beautiful rainbow colored and layered card. I love dies. Beautiful card! I love the colours you used. 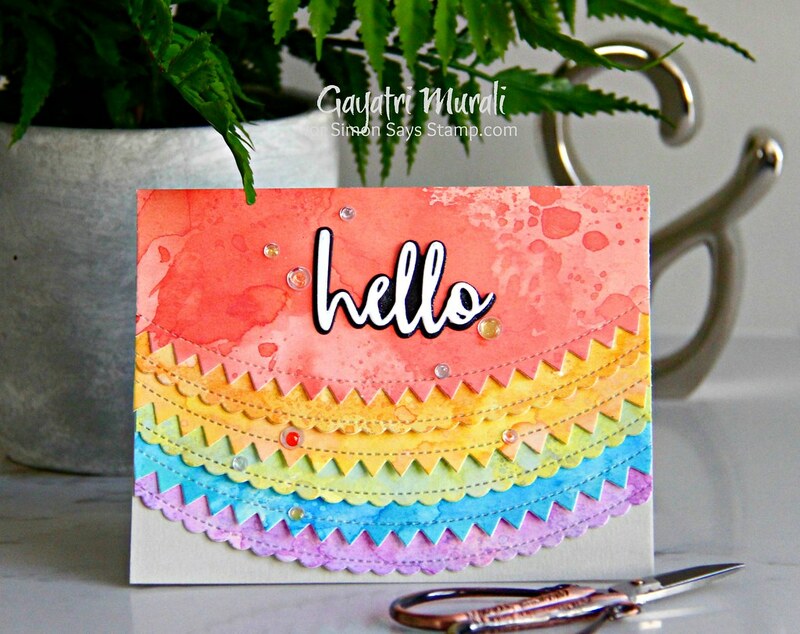 Love your beautiful rainbow card with those pretty border dies! I love the layering idea and the colors you chose are super pretty. Love the layers! Great colors too! Thanks for sharing these cards with us today! Very clever use of border dies! Thanks for sharing! What wonderful cards! You did a great job! Thanks for sharing. Have a wonderful week. WOW Beautiful cards. Great way to use the border dies. I love the border layers. I wasn’t too sure about those dies but now I think they should go on my list. A rainbow is always a great idea : your card is beautiful ! Beautiful! I love all of the bright colors. Love the rainbow! So beautiful!! That’s some great layering in your card! Really love the cards and your creativity! Gayatri, this is a wonderful card. 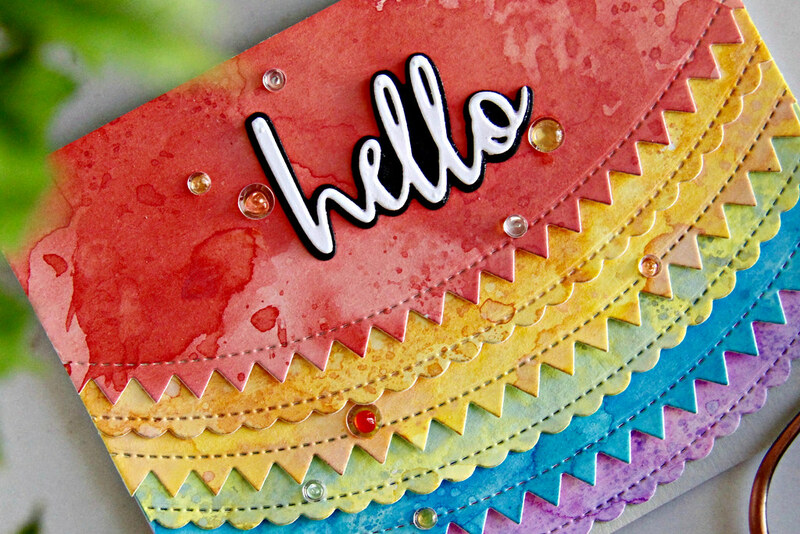 Love the rainbow look and these dies are really fabulous. Oh my goodness….all the dies are sooooo cute and your cards are soooo cheerful…I have to admit that I want ALL of the Picture book dies…they are just too cute…. NIce rainbow, the dies are gorgeous in this way. Thank you for this inspiration. such a pretty rainbow card and so unique! Beautiful! And great tutorial. Thanks! Gayatri, I am pleased to see another designer using one of the curved dies in their design. I love rainbow colours put together and with a large sentiment it just makes this ‘pop’. I too, have started adhering at least 3 or 4 layers of a sentiment on top of each other in order to give this dimension. I have only recently purchased a bottle of black Nuvo drops (I love them though) and I need to add more to my stash from what I see from the effect you have got with other colours on your design. Such a colorful and beautiful card! I love those arched border dies and layered together the way you made it is so stunning! Thanks for the inspiration! The dies seem to be really versatile. Thanks for the great example. I love this idea! I would not have thought of layering this! Love the rainbow colors. Great card. I love the rainbow you created with the die cuts! Very cool idea. Wonderful combination of these border dies, brightly featured Sin rainbow colours! Love the colors! It reminds me of a piñata! Fun and playful! I really like how you used the dies on the watercolor paper. Lovely card and definitely an idea I want to try. Such a beautiful rainbow card. Love how you used the border die. Beautiful layered rainbow stitched borders, very cheerful and fun. Pretty colors – love that pinked edge die. I love the colors of the inks and the way they are layered. Very good job. TFS. I like the rainbow colors of your card. Rainbow colors and cute dies…. I love your creativity. Your card is so beautiful, I adore the way you used the die to make the layers, it came out so awesome. The colors are so bright and pretty, amazing job. Love the rainbow! Very pretty card! Love the rainbow of colors you used; very pretty! Lovely layers with a rainbow of fun. Fun way to use border dies! So colorful – love the stitching border die. Fun idea. Love the colors! How PRETTY Gayatri, good job! Love these border dies. Love the colorful card, very unique! So cheerful! Inspired to use this die! What a bright and cheerful card! Love the way you used the new arched stitched border die. That is one neat card to brighten someone’s day. I LOVE your colorful, happy card! Great use of those cool Dies! Simple die resulting in stunning design. What a fabulous way to use the arched border dies! Beautiful card! I love the colorful way that you used the border die! I have no words, this is a awesome card! Love, love, love the bright colored paper & the wonderful card design! I need those dies!! WoW….fantastic idea! Love the rainbow of colors! I have border dies that would work for this, and I never thought! Thanks so much for the inspiration! Loving this blog hop with all it’s talent and inspiration! Thanks for sharing yours! Love the hello script and the stacked border. For nice idea! Great use of the border die. Very cool effect. 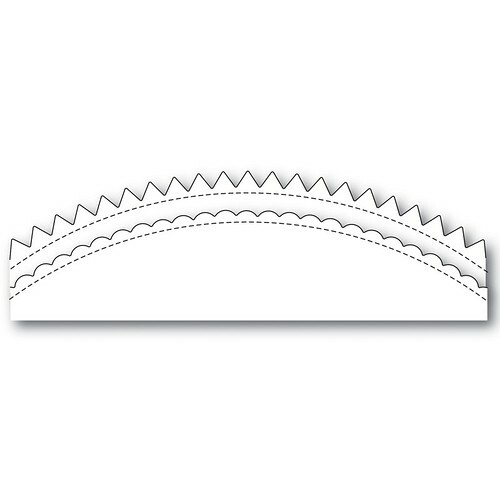 I’m glad to see how to use those arching border dies. I wasn’t sure when I saw them in the release. This is such a great card! The smooshing technique made such interesting inked panels, I love how your card turned out! What a great way to use the die! Love the rainbow effect, thanks for the inspiration! Love the bright colors, thank you for sharing! Clever use of these dies. Beautifully colourful. Thanks! 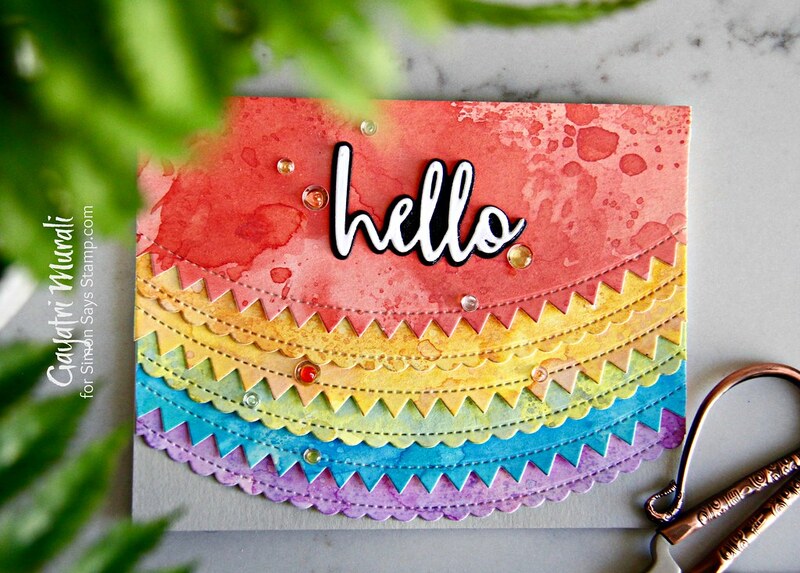 Very nice colors….I like the way you layered the black and white die cuts of the hello die. Fabulous! I love the bright rainbow colors!! Great card! This design could be so versatile! Fantastic card. Great use of the 2 border dies and I really like the font of the “hello” die. Beautiful. I love the rainbow pattern. What a fantastic way to use the border dies. I’ve never thought to do this and I appreciate showing this lovely creation. WHAT A FUN BRIGHT CARD! Your work brought a smile to my face and a sense of joy to my spirit which when you think about it is why we make and send cards to those we care about…..
amazing what can come from a very simple die. Great colors also. Lovely colourful card! Love how you used the Dies. The distress oxide inks make a great background for the Arched Stitching Borders dies! What a fun, colorful card! Sooo fun. I love your use of the dies and the colors really pop. Thanks. What a cool card! Nice and bright, so many layers, I love it. This is really unique, colorful and definitely beautiful! Beautiful card – I love how you alternated the dies and made that sentiment POP! Lovely card, I love the colored layers! I really like these color layers! So pretty!! I just love this card…. all the colors and the die cut hello… too too cute. thanks for sharing. Like the rainbow of colors with the edging borders. Quite a cute card & great idea for using borders! Thanks. Love the rainbow colors. 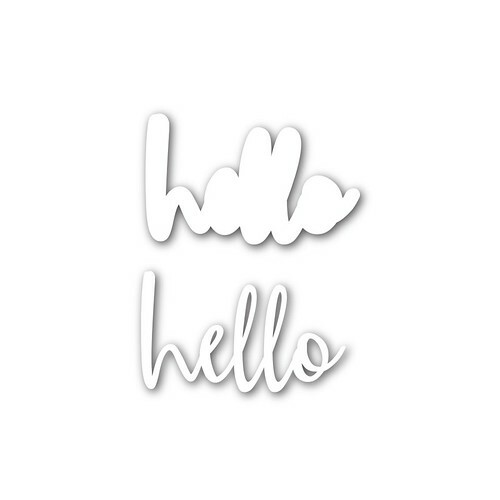 Love the Hello die. Love the card! Love this card idea–great colors. I love the colors you chose, and the stitched borders are very nice. I like that the card looks modern and clean. Now you made me want to get that die. Might as well get the whole collection, even if it takes me 3 months. Thanks for sharing. Great cards and colors! Thank you for sharing. Egad! I placed an order from the first of the DieCember blog hops, and now I HAVE to have those border dies. I love them. Thanks for all the ideas! Love your use of color and border die cuts to create such vivid designs! I love love love the layers and the colors! Your card is so bright and cheerful! Great colors, love the layers and use of the dies. Such beautiful colors. This card really says Hello! such a cheerful card! nice ! What a cheerful card! Love the colors. Love the way you layered the dies and the rainbow colors. You can never have enough rainbow!! Lovely card! Sometimes I look at the die and think, what would I ever need that for? Thanks for your talents and imagination to show us all what I could use that die for. So beautiful! What a clever design! Very clever. Love your colors, patterns, and design. And those dies are amazing. Just lovely. creative use of die and layering it! This is just such a great idea and the colors blend so good together! Thanks for sharing this colorful and creative card! This card is gorgeous, so much color and just makes you smile. TFS! Very colorful card! I really like the script dies with background accent. Really makes the word pop. Thanks for sharing your talent with us! What a colorful and festive card. I love the rainbow colors. Great use of colour and the die. Tfs. Charming card! I like the colors, layering, and design. Wow, gorgeous, love your design! What a fun way to use the new SSS die, love it! This is so beautiful and colorful! Love your fun style! Such a fun way to showcase those borders. Love the bright beautiful colors you used! So very pretty! Love that die! I like that you used multiple colors – very pretty! That die looks like it could be very versatile! Great Card! I love the bright colors and the die gave the perfect amount of texture. Great project. So pretty. Using the border dies to decorate with is so cool! gorgeous layering of the border die. I love all of the colors. Great inspiration!. Great card and to think is was made with a border die. Wow! 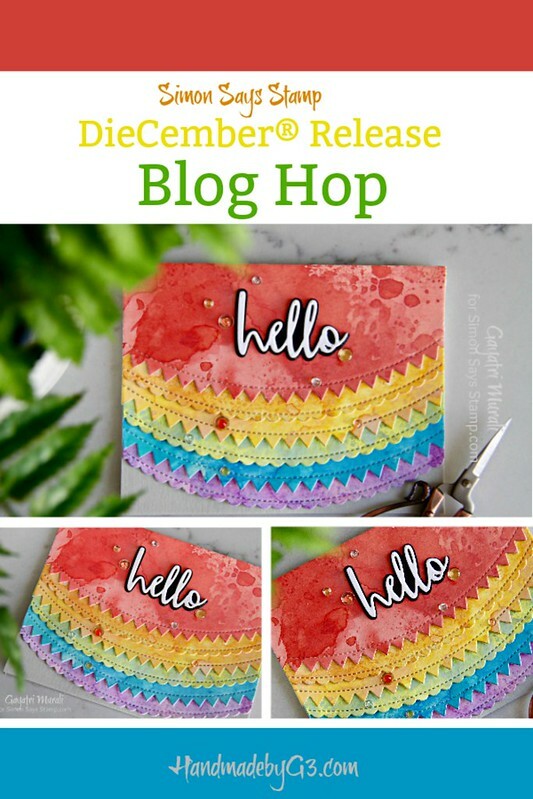 Love the rainbow colors and your use of the die! Thanks for the inspiration! I just love the rainbow effect of the stitched borders! Beautiful card! My cart is full of dies, papers, etc. Thanks for sharing. This is a wonderful release! Merry Christmas! Such festive colours. Love this new die set. Love, love, love your card. Awesome job. Great use of die. Love rainbow colors. The laying of the paper dresses up the card, but adding the stitched border to the layers, that takes it up a notch! Your card will brighten someone’s day! I think this might be my favourite card in the whole bunch, thanks for the great idea! Color choices were stunning. Loved your card. Thanks for sharing. Love the colors thanks so much for your inspiration! I love the way the Nuvo drops look on top of the sequins! Thanks for the beautiful card! The hello really pops on the black. Nice! Lovely card! Love the bright, happy colors. Love the rainbow of colors. I’m always looking for reasons to step up my watercoloring and this is great inspiration. Thanks! What a great way to use the dies! Love the colors you chose! what a fun way to use those borders! What a great idea. It has such a nice flow to it and useful for any occasion. I would have never figured out how to use these dies if it weren’t for the blog hop. Love your use of them! Very fun and colorful card! I really like the Hello card. the layering reminds me of decorative stitching on a piece of clothing. So pretty! very pretty and I love the gorgeous colours! What a fun and happy card! Love all the colors. Love your rainbow – Great card. no matter how hard i try i cant get my smooshing to look like that. i LOVE this. You created a lovely rainbow, great job! Just so bright and lovely!!! Will put a smile on anyone’s face!!! Thank you!!! Great design and so wonderfully colorful. Fabulous card! I love the rainbow layering. I love the look of the watercolor with those crisp die edges. Such a study in contrasts that makes a beautiful whole. And so smart to use the fog cardstock in the background! I always default to white, but I think that would have been too much. Thanks for the inspiration. I love how you layered the die cuts to achieve so many colored panels for your card design. Thanks for sharing. Love your card! Beautiful colors, and very imaginative way to use the border dies! Love it! Love the rainbow sun shape! lots of fun! Such a cheerful card and another great way to use that die! TFS! The layering effect is really highlighted by the the fabulous use of color. And easy too! Love your card, so bright and cheerful! Loved the way you used the border die on this card and the colors are beautiful! Fun card!! I love the multiple colors and the way you used the border die. Beautiful card! I love how you layered the dies! Love the different watercolored look to each of the layers of the die. Great use of it. These border edges are such a great idea, love your card! Such a fun and colorful card! I think the black and white hello die really sets it off! Such a bright and cheerful card. I love ideas on how to use border dies in other ways. What a fun card! Thanks for sharing! Great use of the dies!